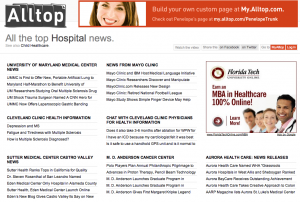 In response to suggestions raised in the #hcsm group discussion on Twitter, Alltop has created a new site, hospital.alltop.com, that aggregates RSS feeds of news releases from several top hospitals. You might want to bookmark or “favorite” it. For people working in healthcare public relations, it’s a good way to see at a glance what kind of news your peers are releasing. 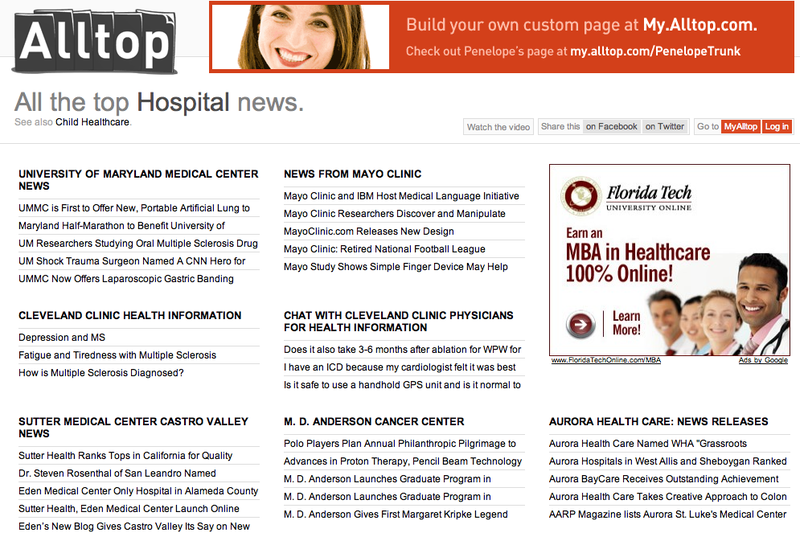 It’s also a good news source for others interested in healthcare news. Besides Mayo Clinic, other institutions featured at launch include University of Maryland Medical Center, Cleveland Clinic, Sutter Medical Center, M.D. Anderson Cancer Center, Aurora Health Care and about 20 others. Thanks to @guykawasaki and the Alltop team for creating this site, and to Tom Stitt (@tstitt) for his leadership in helping to make it happen. that’s interesting, but definitely not at alternative to actually displaying the twitter updates…. what is up with wordpress? do they have a bias against twitter? Thankfully, there is a way around the problem, that lets you both have a badge people can click to follow you, and also display your latest Tweets. You do the first part by following the instructions I had in the previous post. 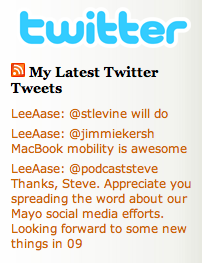 Putting the latest Tweets in is actually easier, because Twitter provides an RSS feed that you can pull into an RSS widget in WordPress.com.